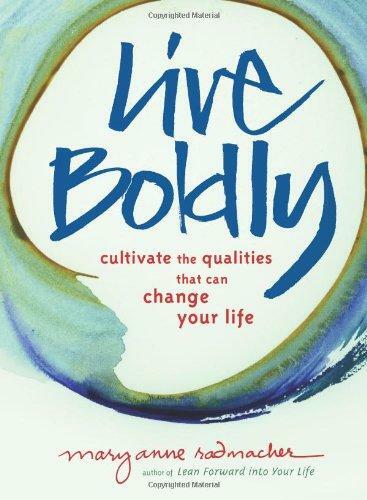 In Live Boldly, Mary Anne Radmacher identifies an assortment of qualities for our life’s journey and defines each as it relates to laughing loudly, loving truly, playing often, working smart, and sharing your heart. Each definition is followed by a quote, a poem, an aphorism that explores the quality. Stories culled from Mary Anne’s own life and teaching practice followed by an invitation to the reader to listen more closely to their lives, to give themselves what they need and to step back into their daily lives, knowing they can choose, in that moment, to live boldly by their own definition. In Live Boldly, Mary Anne Radmacher identifies an assortment of qualities for our life’s journey and defines each as it relates to laughing loudly, loving truly, playing often, working smart, and sharing your heart. Each definition is followed by a quote, a poem, an aphorism that explores the quality. Stories culled from Mary Anne’s own life and teaching practice followed by an invitation to the reader to listen more closely to their lives, to give themselves what they need and to step back into their daily lives, knowing they can choose, in that moment, to live boldly by their own definition. Whether readers need or want justice or gratitude, endurance or celebration, comfort or challenge, the process is the same – read and listen to the word, enter into its meaning in the lives of others and bring that meaning to your own life. Mary Anne Radmacher lives on Whidbey Island, Washington. For many years she lived in Salem, Oregon, where she ran a retail and wholesale business selling her art, posters, and cards. She continues that business. Radmacher also is a speaker and trainer for Participant Centered Results and does workshops on living a full, creative, balanced life. She creates one-of-a-kind posters using the words of President William Jefferson Clinton for the Clinton Museum store. Her words have inspired thousands to “Live with Intention” and “Live Each Day as If It Were On Purpose.” Her saying, “Courage does not always roar. Sometimes courage is the quiet voice at the end of the day saying, ‘I will try again tomorrow,'” is cited in the 2006 Oxford Dictionary of American Quotations. Her first book, Lean Forward into Your Life, was published by Conari Press in 2007. “Live Boldly is not another book with gratuitous platitudes. It is a book that will propel you into your destiny. Mary Ann Radmacher has done that for me through her writings and will do the same for you. Some people have a “near-death” experience. Most people have a “near-life” experience. You can change it all and live boldly.” —Dr. Samuel R. Chand, author of Who Moved Your Ladder? “To live boldly is to create a synthesis between your observed and your unobserved life.” What do you think that means? What does “to live boldly,” mean to you? Mary Anne suggests it’s possible to cultivate qualities we don’t naturally possess. Does our nature determine our qualities? Is it really possible to change our own lives? “Everybody picks things to believe in. I believe I’ll believe in this.” Do you agree that people CHOOSE what they will believe in? Or do beliefs just sort of happen as a function of our parents and our community? What do you BELIEVE IN? What did you CHOOSE to believe in? What beliefs do you have that you didn’t CONSCIOUSLY choose? Ten consistent elements of a life lived boldly are listed in the afterword. What are ten consistent elements in your bold day? The phrase “don’t wait” is repeatedly used in the afterword. What is the significance of not waiting to which Mary Anne is referring? Isn’t waiting part of being patient? Mary Anne uses her life experiences to inspire others to cultivate the qualities that can change their lives. If you were to write a book from your own experience what would it be called and what would it be about? Many events that Mary Anne shares could be classified as “failures,” although she has a slightly different attitude toward failure than many folks do. How could that attitude have an impact on your day? “The most significant elements in my days are laughter, learning, and applying my finest efforts to each endeavor.” Do you identify with this? What would you say are the most significant elements of your days? “Those who have entertained my life with their challenge and difficulty, those who see me through the lens of both adversary and adversity…I thank you for the profound lessons you have offered me in living my life boldly. While I will not name you, I most certainly will always remember you.” Why does Mary Anne end her book expressing gratitude to her adversaries and adversities? Is it really possible to live your life “as if no one were watching?” When? How might this change your experience today?